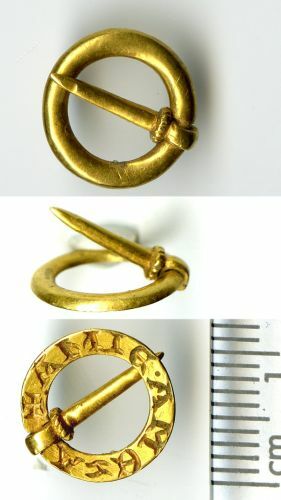 A gold miniature annular brooch, with a slightly convex section, its flat side having an inscription. The frame of the brooch has a notch to stop the pin slipping. The pin has a decorative, rope pattern collar, just before it meets the frame. It is believed that the inscription is a love token and may translate '[to a] loyal friend'.